Catch the Breeze is Level 1-5 in Yoshi's Island DS. 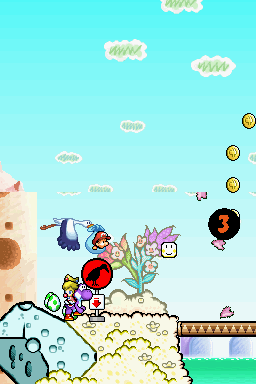 It is the first appearance of Baby Peach as a playable character, and also the first appearance of Stork Stops. The wind, which was previously seen at the end of Level 1-3, Mario's Fleet Feet, is prominently featured in this level. In the first section of the level, the Yoshi can go through a pipe to get a Flower which is in plain sight. The small cave area also has some Shy Guys strolling around, making for an easy egg supply. When Yoshi gets out of the pipe, he sees the first Stork Stop in the game and he can now switch between Baby Mario and Baby Peach, the latter one being needed to progress through the level. Baby Peach can then ride a wind gust to get to the next area. The second section features a Middle Ring and uses mainly wind gusts going straight up, which can be used to get to high places containing Red Coins or Flowers; there is also one diagonal-blowing wind that leads to some Donut Blocks and a Baby Peach Character Coin. After a few more wind gusts, Yoshi reaches the Goal Ring. Kaze ni notte susume! Ride the Wind and Advance! Spanish ¡Atrapa esa Brisa! Catch This Breeze! This page was last edited on April 15, 2019, at 02:06.